The only collator on the market specifically designed for today’s 130-plus bag-per-minute vertical bag makers. 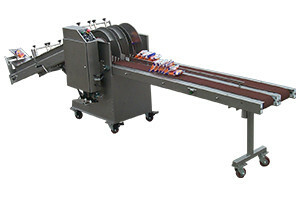 This machine gently catches then conveys the bags into our proprietary twin packing rows, allowing packers to work independently. Efficient and ergonomically friendly, the Double Lane Collator stacks and counts bags, minimizing musculoskeletal stresses and labor requirements.